Remember This? : MicroMagic Frozen Foods | I'm not stalking you. This is a new feature I am starting where I reminisce about old products that I do not want to be forgotten to the tunnels of time. Most of my first submissions will probably be food-related. There is nothing like the empty hole that is left behind in your kitchen when a delicious food product disappears from store shelves. Do you remember MicroMagic frozen food? Because I do, very fondly. 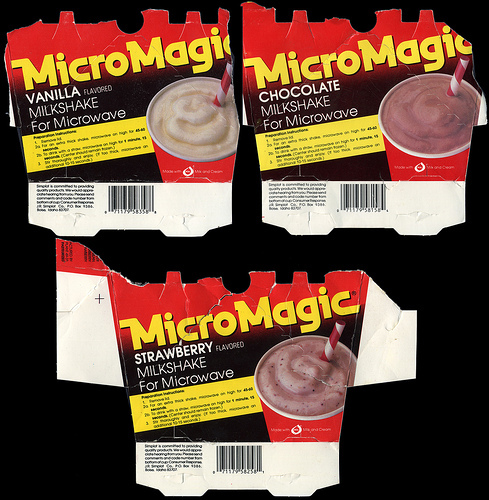 MicroMagic products first appeared in the frozen food section of stores in the 1980’s. There were MicroMagic hamburgers, cheeseburgers, chicken sandwiches, french fries, and three flavors of milkshakes. It was a perfect trifecta of 1950’s car hop food: burger, fries, and milkshake. It was something you expected to see on the tray of Richie Cunningham’s car outside of Arnold’s on Happy Days (there were more external scenes during the first season or two of the show). EXCEPT YOU PUT IT IN YOUR VERY 1980’S MICROWAVE OVEN! It was like going to McDonald’s, without leaving your home. 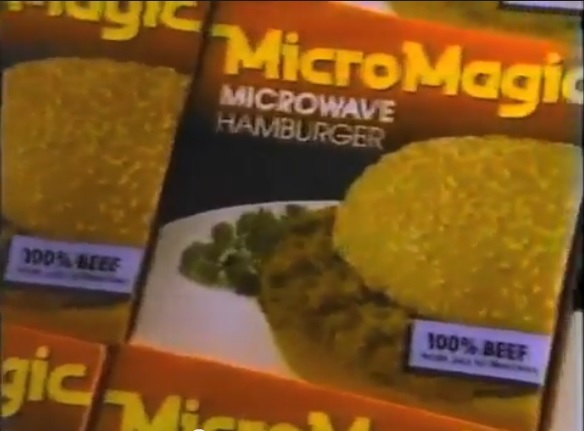 There were several years of my life where my main food source was MicroMagic cheeseburgers. I bought them far more than any of the other products. I was a latchkey kid, so I would eat them before my mom got home from work, or for lunch during summer break. Sometimes I ate them for weekend lunches. FYI–The ones I bought only had English on the packaging. I liked the fries as well. They were sold in three packs. Two boxes of fries often counted as a meal for me. I probably only had all three (burger, milkshake, fries) together probably once. The milkshakes were kind of a waste of money. I mean, it was a cup of ice cream that you put in the microwave to partially melt it. And I seem to remember it tasting a bit like ice milk. Although sometimes it was fun to eat the fries and chocolate milkshake together and dip the fries into the ice cream. Chocolate was the only option for me. While I remember them fondly and wish I could consume them again, I have to admit that they did not come out of my microwave at the height of quality. If I followed the package instructions, the burger would still be cold in the middle. So I always over-nuked it, which led to a hard top bun and the cheese melted off everywhere. But it tasted like a burger, complete with fake smoke flavor. The fries came in a cardboard box that was lined with silver coating, so that they would attempt to get crisp. The fries could be soggy or over-crisp, depending on how long you cooked them. They were always kinda greasy. Seeing as I was a middle school kid who wasn’t old enough to drive and had no fast food place in town to walk to, this was as good as it got. I haven’t seen them on store shelves in years. I searched the Internet, but cannot seem to find out anything about what company used to make them. Some similar products exist today to give you a sense of how awesome they were. I will talk about that in my next post on Thursday. I searched all over YouTube and found a few MicroMagic commercials for you. I will appologize now for making you crave a product that is no longer available. I love the 80’s outfits! I had a black hat like that girl! I also found a Micro Magic Facebook fan page. It only has 13 likes, so feel free to hop over their and “like” that page. And while you are on Facebook, like “I’m not staking you“‘s Facebook page as well. Posted in Childhood Reminiscing, Remember This? and tagged 1980's, cheeseburger, fast, food, French, fries, frozen, hamburger, junk, MicroMagic, microwave, milkshake, nostalgia. Bookmark the permalink. Pingback: If You Miss The Days of MicroMagic, Try These | I'm not stalking you. I found this blog entry by doing an image search for “1950’s burger and fries” looking for vintage food images from the time of my parents’ youth- and here I unexpectedly find this nostalgia from my own time. And, look, it’s even a post that’s less than two years old, so I don’t feel completely silly commenting… only a little. Ahh, I remember coming home from school when I was in 2nd grade and eating the frozen fries before my mom and dad got home. It was like pre-dinner. The shakes were melted ice cream deliciousness… and now I am hungry-nostalgic for these foods that, now as an adult, I can eat better versions of any time. 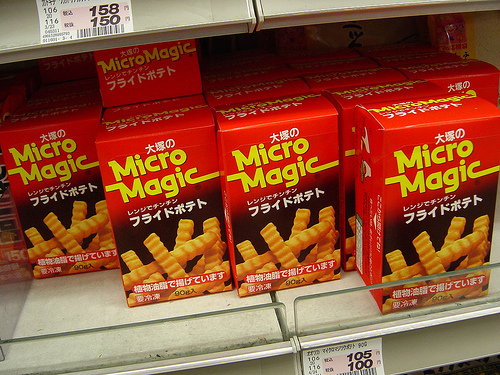 I LOVED micro magic fries. The burgers weren’t as good since the buns would come out hard. Only had the milkshakes once since, yeah, those were just ice cream in a cup. They were made by J.R. Simplot. They were absolutely delicious. yup. when my parents use to go out on saturdays THIS was what my brother and i were hoping for a meal. the burger bun did get hard but the fries were good. the microwave was new at the time so it was MAGIC! it wasnt McD’s but damn it was close enough! I miss this stuff! The burgers were so good! I wish they’d bring this stuff back! I was just sitting here eating leftover fries from dinner and thinking of how french fries never reheat well except for the magic fries I ate as a kid and thought I’d Google it to see if you could still buy they and saw this I ate the burgers and fries 3 to 5 times a week.